So, what makes a plant a rock garden plant? 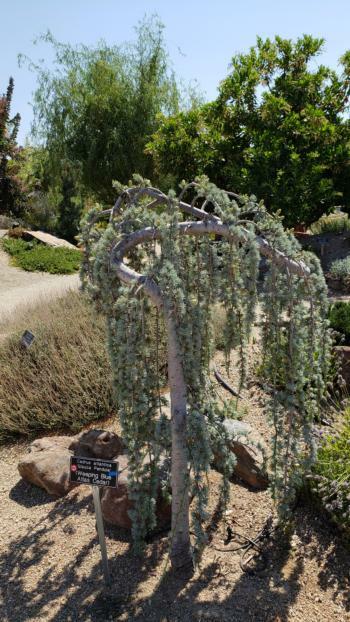 At the Sherwood Demonstration Garden, we have gone with a broad definition for a rock garden plant: one that looks great growing in and amongst rocks. Rock garden plants can be found everywhere and are seen all over the world - in the forest, at the coast, in the desert, in the valley, and certainly, in the mountains. Our goal is to consider all of these sources, but to choose plants that will thrive in the specific climates of El Dorado County. When selecting our rock garden plants, we also consider the rock gardening principle of proportion—keeping the sizes of most of the plants in proportion with the rocks. Most of our plants will be no more than 24 inches in height. Why a rock garden? Once established, rock gardens are beautiful, low-maintenance and natural, seemingly part of Mother Nature’s landscape. They can be the envy of your neighbor with large lawns considering the drought. If planned correctly they are in season year round, and they add interest and variety to the landscape. They are well suited to our area and can be designed as a low-water-use garden. 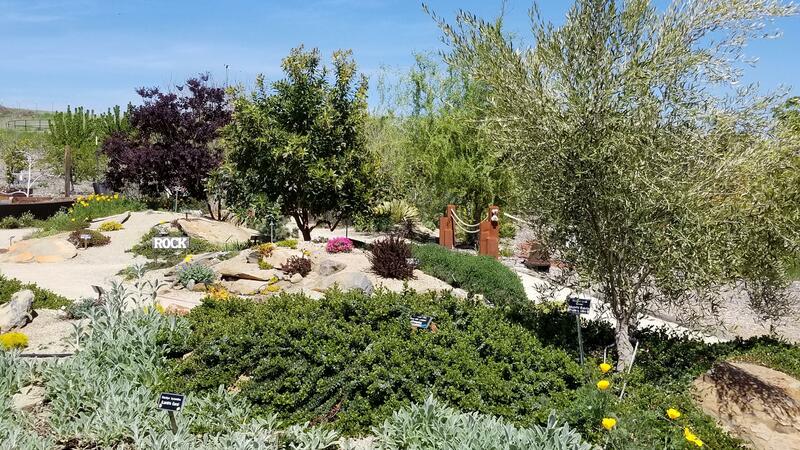 In contrast to other types of gardens that look manicured and not natural, you can create an effective rock garden that seamlessly blends right into your landscape - a nature lover’s dream. A natural-looking rock garden is a fantastic way to highlight those flowers and plants, like Phlox subulata (Moss Phlox), Arctostaphylos ‘Emerald Carpet’ (Creeping Manzanita), Lavandula augistfolia (English Lavender), that blend into other types of gardens and lose their uniqueness. What are the goals of our Rock Garden? 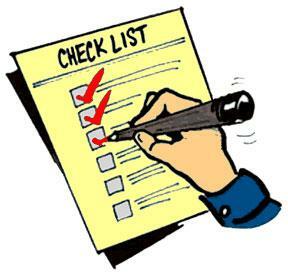 Our overall teaching goals are to familiarize the gardening public with the reasons for making rock gardens. In addition, we aim to provide basic information and ideas for selecting a site (using mounds and slopes and setting rocks), planning an overall design (style, use of heights and widths, and colors), choosing suitable plants (soil/water needs and sun/shade exposure), and setting up an appropriate irrigation system (drip and hand-watering). Our rock garden will be a model to see how plants and rocks can be arranged and displayed to create an attractive natural,low-water, low maintenance space in your garden. In the heat of summer, the plants in the Rock Garden thrive. Let's focus on the anchor trees in this garden. Besides providing shade in this very sunny area, these trees also provide height and a variety of green tones for year-round interest. 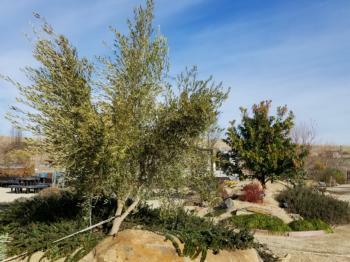 The Weeping Blue Atlas Cedar was moved from the Marsh to the Rock Garden. The move occurred a year ago; not only did it survive, it has new growth and is forming cones. It's spiraling truck and its blue-green needles are a natural partner to the garden rocks. 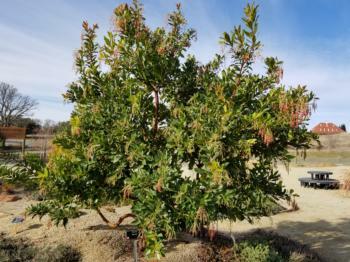 The Arbutus 'Marina', also known as a Strawberry Tree, has year-round interest. It is an evergreen of deep green leaves. Its bark is red like manzanita and madrone and peels in the same attractive way (but is not messy!). It's tiny pink bell-like blooms in mid-summer bring a welcome relief to a hot summer day. The little bells form strawberry-like fruit in fall and winter. Something for every season. The gray-green leaves of the fruitless olive tree contrast nicely with the dark green of the Strawberry Tree. It brings welcome shade on a hot summers day, is fruitless and evergreen. It has an airy and cool appearance.